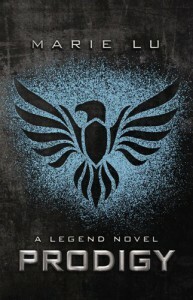 Prodigy was a fast paced thrill ride just like Legend, but for some reason I didn't enjoy it as much as the first one. It probably has something to do with all the hype surrounding this series and I just expected too much. The best part about this book was probably June. She really changed from who she was before she met Day. She is no longer blindly loyal to the Republic, but she is still pretty badass. For the most part June seems invincible, but a little over half way through the book she gets sick and for once she has to have Day take care of her. That was probably one of my favorite parts because it really shows that June isn't just the Republic robot that everyone thinks she is. Almost all the other characters except for Kaede really bugged me. Day was blindly following the Patriots. From the beginning of the book June warns Day about the Patriots, but he doesn't listen. He thinks she's only saying things against the Patriots because she's still loyal to the Republic. That really bothered me because shouldn't he know that June is no longer loyal to the Republic? Then there was Tess. I don't know if I'm alone in this boat but I really don't like Tess. She kept putting thoughts into Day's head that June is a traitor and that they don't match like Tess and Day do. Thankfully by the end Day was back to his old self. While Day and June were apart on the mission to kill the Elector, a love triangle/square formed. June really struggles with her feelings for Day throughout the book. She doesn't know if things will work out between them since she's responsible for killing his family. She also starts to think that it would be easier to be with Anden since they "match". Day has a similar problem with Tess, but after awhile it was clear to me that June and Day match even if they are very different. Until the ending I thought everything would be alright, but then I got to the end and it killed me. I knew that something bad was going to happen because every review I read talked about the cliffhanger, but I was not prepared for what happened! In Prodigy more about the Patriots is revealed. A little about the Colonies is also revealed but I would still like to know more about it. The world became a little more real to me in this book because almost all the questions I had about the Republic and the Patriots were answered. Prodigy is for anyone that loves a fast paced book with action on almost every page.